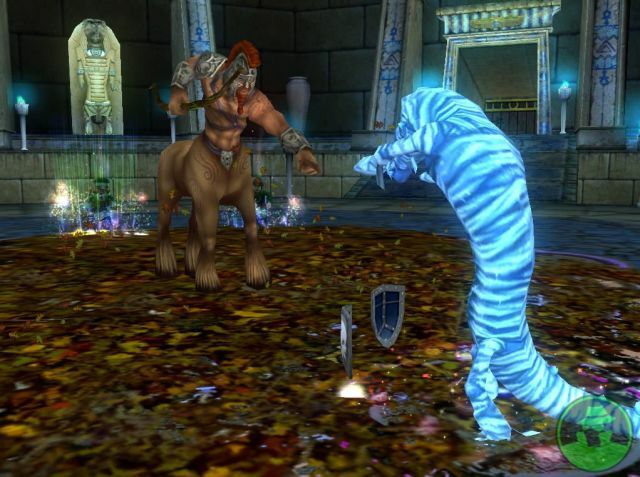 Wizard 101 is a turn-based MMO utilizing spell-cards to cast offensive and defensive magic in online duels. The game pits players against each other in a "dueling circle" of up to 4 human players (the player and 3 others against computer-controlled opponents). There is a PvP area as well though it's small and you can't access it when you first start playing. You have to unlock the PvP area by questing and then you meet an NPC that will allow access to the arena. Dueling revolves around shiny orbs called pips which provide the ability to cast spells. The more powerful the spell, the more orbs it takes to cast. Every so often you'll get a yellow pip or power pips which count as 2 normal pips. Some of the more powerful spells have some amazing visual effects with very bright colors, explosions, and appear to be very large-scale compared with the characters. The background music gets repetitive if you're stuck leveling, questing, or grinding in one specific area for too long. But, you can always move on to another area for some different sound. Strong Points: Graphics are crisp; wonderful visual effects. Weak Points: The music gets repetitive; limited area of free play. Moral Warnings: The game play is spell-card based with some occult symbolism. Spells are divided into 7 different schools: Balance, Storm, Fire, Life, Death, Ice, and Myth, as well as three secondary schools: Sun, Moon, and Star. The Primary schools reflect the playing style of the player: Balance focuses on buffs, Storm focuses on damage, Fire adds damage over time, Life deals out healing, Death focuses on stealing, Ice provides defense, and Myth creates minions to do the work for you. The Secondary Schools are only available to players level 50 and above. Sun adds enchantments, Moon focuses on Poly-morphing or physically transforming, and Star governs auras which are buffs that surround a player for a certain amount of time. Besides your playing style, you can also customize your character in a myriad of ways by buying new equipment with the gold you earn from quests, dropped from mobs, or from a high score in a mini-game. Equipment is level dependent and clothing comes in three categories: hats, robes, and boots. You can also customize the colors at a seamstress if you desire. You can also collect wands, athames, amulets, rings, pets, mounts, and decks allowing for further customization. If you need a break from duelling you can also set your sights on questing or kill mobs outside of the main cities. If you wish to embark on a quest, a yellow exclamation point above the quest-givers head will let you know that one is available. A gray question mark means that a quest is incomplete and a yellow question mark means it's ready to be turned in. Players are also equipped with a Quest Journal to keep track of which mission they're on as well as a HUD arrow to point the way to each objective. Wizard 101 revolves heavily around the use of magic. Some may have an issue with this while others may not. Christians should evaluate where they stand on the subject, as with any game, especially those who where saved from the Wiccan philosophy or the occult. It's unfortunate because with solid game play, stunning visual effects and over 20 million registered users, Wizard 101 is a great choice for gamers and their families.